Sage is an herb which is related closely to rosemary. In fact, many of its health benefits are owed to the presence of rosmarinic acid which is also found in its sister herb. Sage is an evergreen herb that has blueish purple flowers and woody stems. It is actually a native of the Mediterranean region but has since been naturalized to many other parts of the world. Sage is an herb with a very long and distinguished record as a food and a medicine. The Ancient Egyptians saw it as a fertility drug while Greek doctors used an aqueous decoction to stop wounds from bleeding and to clean sores and ulcers. Sage has also been used traditionally to soothe coughs and sore throats and used externally on wounds and sprains. Gargling with a tea made from its leaves, is a popular remedy for coughing and throat soreness while many herbal practitioners have recommended it for rheumatism, menstrual bleeding and to promote lactation. Over the years it has also been used to help strengthen the body’s nervous system and to improve memory and sensual awareness. These properties include antimicrobial, anti-inflammatory, anti-fungal, astringent, carminative and emmenagogue effects which give the herb a vast array of potential health uses. 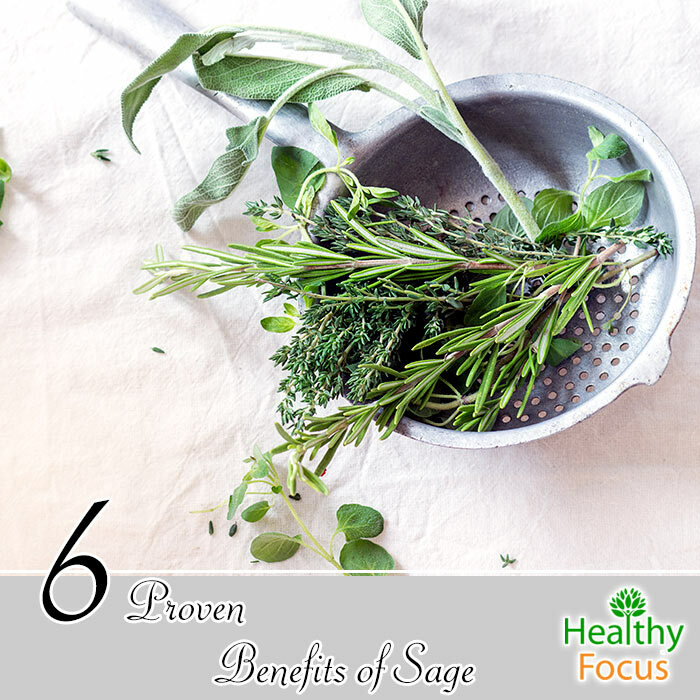 Sage has numerous excellent benefits for your health. As a tea or infusion, it can be an excellent remedy for fever and nervous disorders. It is an excellent tonic which can help with poor digestion, kidney conditions and liver problems. It is strongly indicated for respiratory difficulties, coughs and sore throats while many people use it to deal with joint pain, lethargy and arthritis. Below are some of the most important and best known uses of this impressive herb. Sage tea is a popular remedy in many countries such as Germany where it is applied topically or gargled to deal with inflammation. Sage is used in various forms including extract, tincture and in essential oil form as a medicine for gastrointestinal problems and oral inflammation. The rosmarinic acid found in sage is largely responsible for its anti-inflammatory ability and the German equivalent to the FDA – ‘the Commision E’ has approved the use of the herb for gastrointestinal upset and also for external use to treat conditions like swelling in the mucous membranes in the throat and mouth. Sage has excellent antiseptic and antibacterial properties which has seen it being used to effectively treat throat infection, gum and tooth disease and oral ulcers. The phenolic acid found in sage are especially effective against the Staphylococcus aureus bacteria while in vitro tests have demonstrated that it is also effective against other forms of common bacteria like E. Coli and Salmonella. It can also be used to great effect against common fungal and yeast infections including Candida albicans. Sage is also high in tannins which gives the herb an astringent effect and makes it an excellent natural remedy for diarrhea. Many people use sage to deal with indigestion because of its soothing carminative properties. It can help to stimulate intestinal motility, improve the flow of bile and the function of the pancreas making the entire digestive system work more efficiently. Not only that but many women find that it can help treat painful cramps associated with menstruation. Sage also has anti-spasmodic properties which can help to soothe muscle cramps and tension. It can be very effective against asthma attacks when inhaled through steam inhalation. It is also a great remedy to relieve congestion caused by a build-up of mucus in your airways while it can also help to prevent a secondary infection from taking hold. One of the main uses for sage is to help relieve some of the familiar symptoms of the menopause. Many herbalists recommend using sage for symptoms including hot flashes and night sweats. Another study published in 2013 found that sage in both aqueous extract and infusion forms helped participants experience a reduction in menopausal sweating. (2) Both of these studies concluded that sage was well tolerated and could safely be used as a safe and effective herbal treatment to remedy hot flushes and sweating caused by the menopause. There are times in our life when we could all do with a little more focus whether it is work related or to boost your brain power before an important exam. Sage is believed to have similar effects to rosemary in the way that it can help your cognitive function and improve both memory and concentration levels. Sage is also being investigated for its potential to deal with diseases of the mind like dementia and Alzheimer’s. Sage can be added to your cooking and who does not love a good stuffing made with sage but the most popular ways of using the herb medicinally is either to drink it in a tea form or by using its essential oil. Sage tea can be drunk to help treat digestive and circulatory complaints. It is also a popular beverage to soothe respiratory problems like asthma, coughs, bronchitis and throat inflammation. It has also been traditionally consumed to help emotional issues like depression, improve memory and to treat skin conditions. Sage essential oil is a potent therapeutic oil which is commonly used to help treat a wide range of medical complaints. The uses of sage essential oil include improved circulation, digestion, respiration and metabolic function. Sage essential oil has excellent anti-inflammatory antispasmodic, antiseptic, astringent and carminative properties which give it a much wider range of potential uses than the ones already discussed in this article. Sage tea and essential oil is generally regarded as safe but when it is used in very high concentrations, it may cause some problems in some people. Sage contains a compound called thujone which is dangerous when it is isolated but is unlikely to cause any adverse reactions if sage oil is used in moderation. However, the thujone content does present some problems and children and sensitive people should avoid using sage oil or any other herb with a thujone content. Sage oil can stimulate uterine contractions so should not be used during pregnancy. It can also heighten feelings of intoxication and is best not combined with alcohol. Because of its stimulant effects, it should not be used by people suffering from epilepsy and hysteria.